The two online writers Neil Cybart and Dan Frommer have delivered just before the weekend, two noteworthy articles on Apple’s current product lineup. We recommend you to read them during the second Advent weekend. Dan Frommer is devoted to his “220-Day Apple Watch Review” excluding Apple Watch and describes the past half year, with Apple’s iPhone partner. A text that will be at least the Apple Watch phone users among you, probably nod in several places with your head. Neil Cybart enters the stage with a much broader perspective. His 2200 word essay “The Grand Unified Theory of Apple Products” trying to conceive Apple devices strategy. Why has Cupertinos equipment program 12 different computers, iOS and watchOS devices expanded in the past four years to a whopping 25 and more than doubled? Which rethinking processes have been used for the presentation of the first iPad in 2010? And: What job should take the iPhone into a daily routine, to the solid components also Apple Watch and iPad belong? At the Apple Watch introduction keynote, Apple changed its tune when explaining its product line. Instead of positioning product categories in such a way that each product played a specific role in our lives, Apple began moving down the path of consumers picking and choosing the devices that made the most sense for them. The now classic, “product profile” slide made its debut (pictured below). 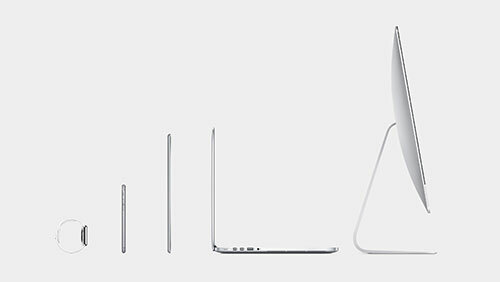 All of Apple’s primary products fit on one spectrum. What do you thing about these articles and Apples strategy? Please leave a comment below. Be the first to comment on "Weekend reading: “220 days Apple Watch” and the “theory of Apple products”"